Honey and cinnamon have not been clearly found to cause weight loss directly. However, research shows they help lower blood sugar and cholesterol levels, which are related to being overweight or obese. There are many ways to use honey and cinnamon. 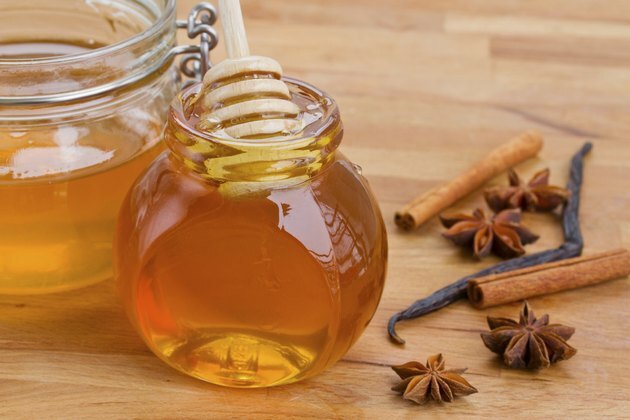 Brew cinnamon bark tea and add honey as a natural sweetener. Spread honey on toast and sprinkle ground cinnamon on top. Per tablespoon, honey contains 64 calories and 17 grams of carbohydrates. Because honey is so rich in sugary carbohydrates, diabetes patients should only eat it occasionally and in small amounts to keep blood sugar levels on track. In a study published in the "American Journal of Clinical Nutrition" in 2007, diabetes patients were administered either 6 grams of ground cinnamon in rice pudding or rice pudding alone. Those who had cinnamon experienced lower blood sugar levels after eating than those who did not. The researchers found this to be the result of slower stomach emptying in those who ate cinnamon. When your blood sugar is high from eating too many carbohydrates, there is not enough insulin to convert the sugar you eat into fuel. The sugar builds up in your blood, getting stored instead of burned. Over time this increases your risk of being overweight or obese. In a study published in the "International Journal of Food Sciences and Nutrition" in 2009, diabetic patients were given honey every day for eight weeks. Compared with the control group that did not eat honey, those who consumed honey experienced decreases in cholesterol, triglycerides and body weight. The scientists concluded honey can play a beneficial role in weight-loss efforts, especially in diabetic patients.